Recorded June 4, 1982 at Studio 105, Radio France/Paris. 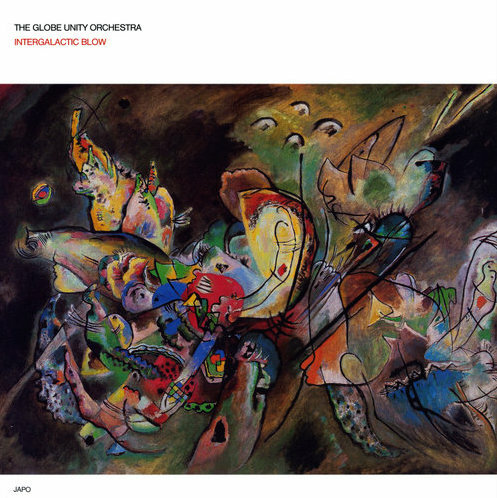 Beginning in 1966, the Globe Unity Orchestra sparked a four decades-long run that intersected with the JAPO label on three counts. For this, the group’s second for ECM’s sister label, founder Alexander von Schlippenbach hand-selected a set of free improvisations emitted in a Paris studio in June of 1982. Even more noticeable this time around are the contributions of its brass players, especially trumpeters Kenny Wheeler and Toshinori Kondo (who takes the place of Manfred Schoof from the last record). Their methods of integration on the opening track, “Quasar,” set a tone that is dashed as quickly as it is established. From the farthest reaches of inner space, the musicians work their way to the front altar of the mind, where Ernst-Ludwig Petrowsky’s baritone files its utterances in living order. Tuba (Bob Stewart) and piano (von Schlippenbach) speak out of time—one from the future, the other for the past. Such is the ethos of the hour. Even at its densest, Globe Unity makes sure to leave a door open for even the most transient listener, so that “Phase A” and “Phase B” feel no more connected by name than they are by process. It is their very incongruity that partners them in the album’s grander scheme, interpretable only after the fact. Their gestures are more jagged, turned from shining to brilliant by Evan Parker’s unmistakable soprano. Like the group as a whole, he takes rising levels of intensity as opportunities for sane reflection, thus allowing himself the strongest benefit of performance: being heard. Drummer Paul Lovens is another master in this pool of many, adding to the 19-minute “Mond Im Skorpion” a scripture’s worth of microscopy. Amid this bramble of riffs and utterances, he treats every melodic branch as a fuse to be lit, and every lit fuse as a pathway toward new understanding of the improviser’s craft. Von Schlippenbach is again noteworthy for attuning to that same inner habitus, an environmental assemblage where one has to know where one has been in order to move toward the unknown. For even as reeds and brass elbow the horizon with the force of sunset, they hold the following morning in their chests. A snake-charming soprano seems to mock the wayward Orientalist who sees travel solely as a means of sticking another postcard in the scrapbook. Indeed, you will find no tourists here—only the artisans selling their wares on the outskirts of town, far from the crowded bazaar, where a cacophonous ending sings, proclaims, and teases every tether of dusk so that it might pull out another day from under our feet. Globe Unity keeps everything clear and, thanks further to Thomas Stöwsand’s flawless production, ensures that every shout is also a whisper, and vice versa.